You can tell by now that I’m way into cherries this season. 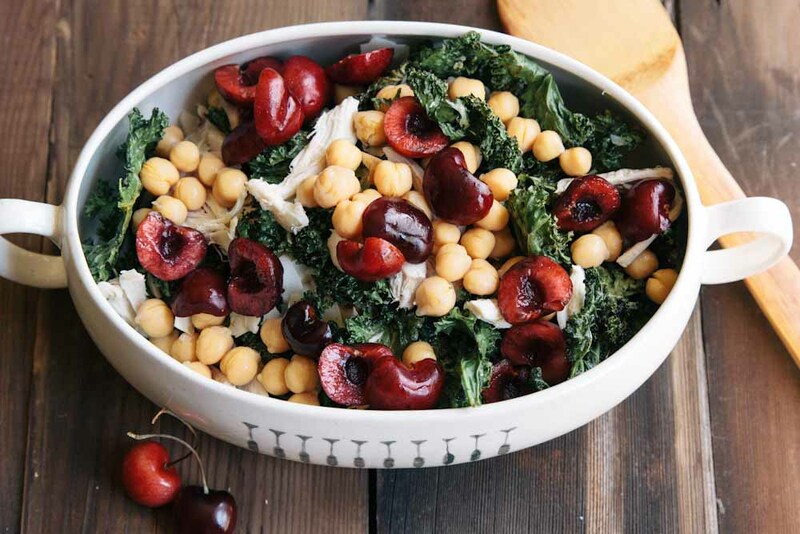 The cherry galette for my birthday wasn’t enough so I also made this easy cherry kale salad in addition to just snacking on cherries throughout the day. They are the perfect little snack and so fun to have on the dinner table with friends. chat and finish up making the meal. Cherries are a perfectly simple and delicious little appetizer. This kale salad is a one off of the Coconut and Kale Chicken Salad that I posted a few weeks ago. Both are great as side dishes or as a main dish for a light meal or lunch. What are you making with kale these days? 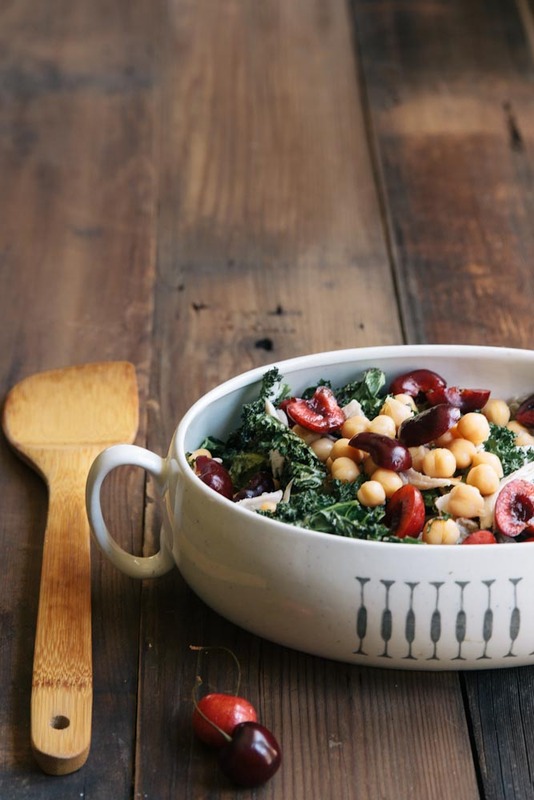 A great summer salad of toasted kale and coconut with fresh cherries. Preheat oven to 350 degrees. Toss kale and flaked coconut with coconut oil, honey wine vinegar, salt and coconut sugar. Mix well to coat all of the kale with the seasoning. 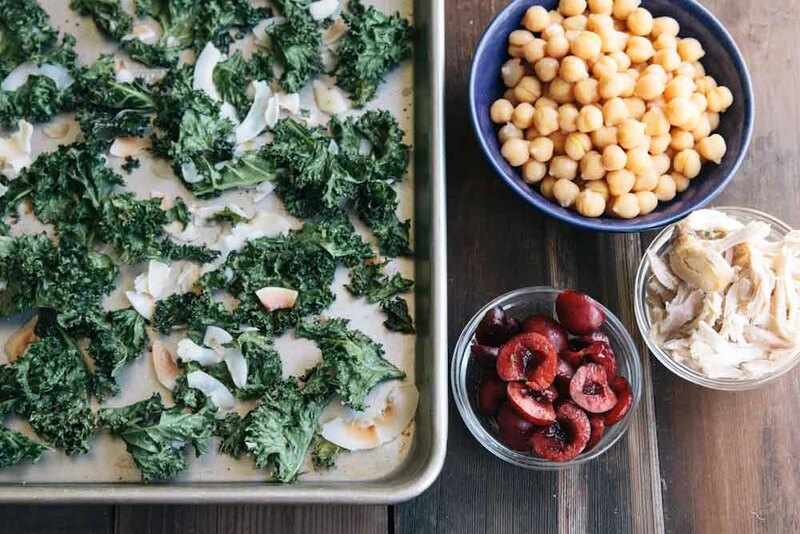 Lay the kale and coconut out evenly on a baking sheet and toast for about 12 minutes. Remove the kale from the oven. Then taste and add extra salt and pepper to your liking. 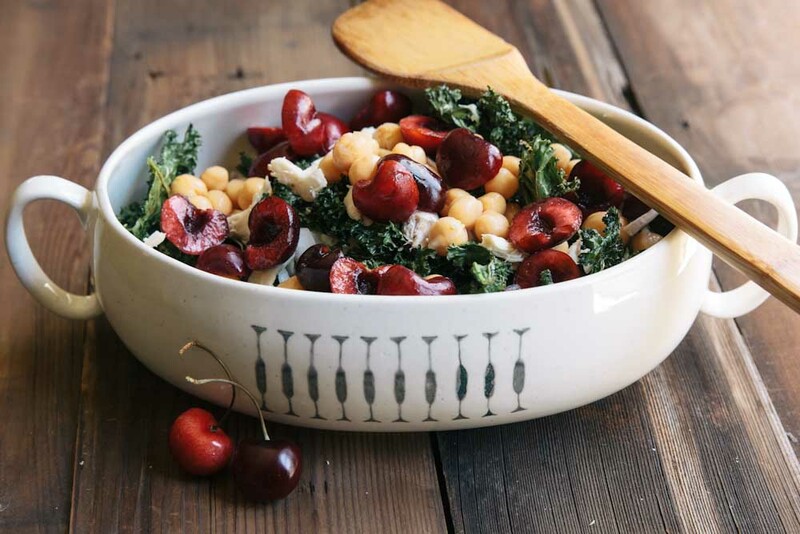 Top with cherries, chickpeas and chicken. this looks absolutely delicious! i could eat the whole thing in one sitting! Looks delicious and I love that serving dish. What a beautiful salad! The colors are gorgeous, and those cherries look absolutely perfect! Thanks Ashley! Hope you’ll stop back by the blog soon. I made this a few nights ago and it was terrific. Served with a baguette and it was a lovely little meal. Great to hear Jeff! So glad you enjoyed it. Cherry season is one of my favorites!